A living room was used as a modeling studio in August for a fashion show in Juba, South Sudan’s capital. JUBA, South Sudan — Even by the standards of fashion models, the women teetering in their high heels on the dirt catwalk here were remarkably tall and slender. But judging by South Sudan’s many towering inhabitants, they were hardly out of the ordinary in the young nation’s capital. As the rehearsal here at the Bedouin Lodge progressed, Akuja de Garang , the organizer of the event, was less concerned with her regal beauties than with one of the men in her fashion show. “That’s my male model, you see? The one in the orange,” she said, gesturing toward a well-built young man. The question was whether he would be willing to appear in front of an audience of hundreds shirtless except for a traditional Dinka beaded corset. “Is he brave enough to do it?” Ms. Garang asked. Up to this point, South Sudan’s most famous fashion statement has probably been President Salva Kiir Mayardit’s predilection for black cowboy hats . Beauty pageants are unusually popular here, as is wrestling, both the serious athletic contests and their gaudy American cousins like World Wrestling Entertainment. The clothes tended to blend traditional African fabrics with more modern cuts. But the success of the country’s most famous supermodel, Alek Wek, notwithstanding, the most common images of South Sudan are still armed rebel fighters or malnourished children, the visual hallmarks of the series of conflicts that have raged across its territory for decades. With her Festival for Fashion and Arts for Peace, now in its second year, Ms. Garang, 38, is trying to change not just outside perceptions, but also the way people here see themselves and one another, especially in a nation still rattled by interethnic tension and violence. The fashion show in August was only part of the event drawing South Sudanese from all over the country, many flown into the capital on United Nations planes, including drummers and dancers, singers and rappers, as well as an arts and crafts display. 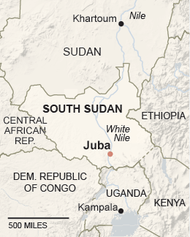 Juba, booming with construction, has few paved roads. The fashion show is a small project compared with Unesco’s work to help set up a national archive, which it hopes to inaugurate here in 2015. The group is also working on a concept for a national museum that ideally would break the mold of the traditional Western-style museum. It is all part of a larger effort to establish not just a seat of government, but a capital for a new nation. With every tiny step, the country inches closer. Last year, actors from the South Sudan Theater Company represented the country at the World Shakespeare Festival in London, performing “Cymbeline” in Juba Arabic. In July, the president named the country’s soccer team the Bright Star as it beat a team of players from the diaspora 3-2 at the Juba soccer stadium. Juba still has the feel of a provisional place. There are few paved roads, and most of the dirt tracks are rutted like a half-built motocross course, with puddles that could pose as ponds when it rains. The city lacks the sort of grand colonial architecture that still stands in many African capitals. But those familiar with Juba before independence from Sudan in 2011 see a city booming with construction, with apartment blocks, hotels and even 10-story office buildings sprouting up. “When we compare Juba from the year before we were called South Sudan, there is a great change,” said Davidica Ikai, chairwoman of the Itwak Women’s Group, one of the groups displaying and selling their wares at the festival. Mer Ayang, a singer who performed at the event, said she hoped the development in the capital would not come at the expense of the rest of the country. “I would judge my country in terms of development on better schools, hospitals, streets and public services,” she said. Progress has not come without costs. Local homes have been destroyed to build compounds for expatriates, with treated water trucked in from the White Nile and electricity provided by constantly humming generators. taxis. Many of the motorcyclists come from neighboring Uganda. Eva Logune, a South Sudanese model based in Malaysia, said the fashion and arts event was a chance to showcase another side of the country for a change. Decades of civil war created millions of internally displaced people and refugees, many living in neighboring Kenya or Ethiopia, or in South Africa, the United States and Canada. Ms. Garang herself was born in Juba and moved as a child to Khartoum, Sudan’s capital, after her father died. When she was 18, she and her mother moved to Cairo, where at first she had to work as a cleaning lady. Because she spoke English well, she was able to find a better job as a receptionist, but she still remembers the casual racism that confronted her while riding the bus in Egypt. She moved again, to Britain, eventually earning a master’s degree from the University of London’s School of Oriental and African Studies. She returned to what was then southern Sudan just before the Comprehensive Peace Agreement that charted the course for independence was signed in January 2005. Through her work with the United Nations and nonprofit groups, Ms. Garang traveled the country, collecting so many artifacts she turned her home, as she put it, into a mini-gallery. She combined her hobby of collecting with her interest in fashion to organize the first fashion show last year, completely self-financed. This year’s clothes, all locally designed except for a line by an Ethiopian designer, tended to blend traditional African fabrics with more modern cuts. The models had not developed the cool nonchalance of their counterparts in Paris or Milan yet, and were bopping and shaking behind the curtain to Nicki Minaj’s song “Starships” as they waited to go on. 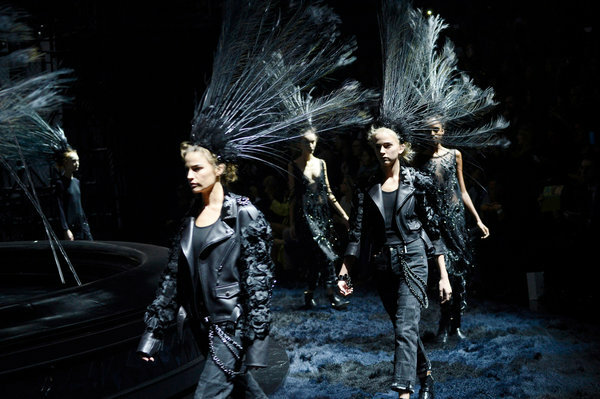 A female model with a shaved head and an extra-bouncy strut got the consistently loudest applause. The loudest, that is, until Ms. Garang’s male model appeared, his broad shoulders and chest bare, and his waist hugged only by bright orange, yellow and blue beads, to gaping stares from the men and whooping cheers from the women. I have a perpetual love/hate relationship with the love/theft of Africa and blackness, which is why I write about it. Afrochic, the name I have given to African/black-influenced Western clothing, is a trend that has considerable longevity. Beyonce’s appropriation of this mode, though, is definitely in my highly questionable category. Her deployment of this style has no rhyme or reason to it – especially with the animal print and her blackface photographs from 2011. I never find her original and she certainly displays a lack of awareness of the historical implications of the various memes that she recycles. Her theft of African material culture disregards the serious and damaging impact of these tropes on Africans and other people of African descent and Africans, who suffer the racism that is often engendered by such imagery. I see simple exploitation for her own gain only and no effort to critique or re-imagine the blithely unconscious manner in which Europeans and Americans appropriated African culture during the height of the colonial era. I guess she has never seen the work of Yinka Shonibare MBE. Eternal Afrochic. The trend launched early in the 20th century that I research remains in vogue.